For the professional wrestler, see King Curtis Iaukea. Curtis Ousley (born Curtis Montgomery; February 7, 1934 – August 13, 1971), who performed under the stage name King Curtis, was an American saxophonist known for rhythm and blues, rock and roll, soul, blues, funk and soul jazz. Variously a bandleader, band member, and session musician, he was also a musical director and record producer. 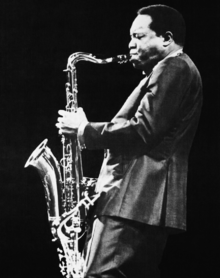 Adept at tenor, alto, and soprano saxophone, he played riffs and solos on such hit singles as "Respect" by Aretha Franklin, and "Yakety Yak" by The Coasters (the latter of which later became the inspiration for Boots Randolph's "Yakety Sax") and his own "Memphis Soul Stew". The son of Ethel Montgomery, he was born Curtis Montgomery in Fort Worth, Texas, and was adopted, with his sister Josephine Allen, by Josie and William Ousley. Curtis Ousley attended I.M. Terrell High School, and studied and performed music with schoolmate Ornette Coleman. Curtis started playing saxophone at the age of twelve in the Fort Worth area. He took interest in many musical genres including jazz, rhythm and blues, and popular music. As a student pursuing music, he turned down college scholarships in order to join the Lionel Hampton Band. During his time with Hampton, he was able to write and arrange music and learn guitar. In 1952 Curtis decided to move to New York and became a session musician, recording for such labels as Prestige, Enjoy, Capitol, and Atco. He recorded with Nat Adderley, Wynton Kelly, Buddy Holly, Waylon Jennings and Andy Williams. Curtis enjoyed playing both jazz and rhythm and blues but decided he would make more money as a rhythm and blues musician. In a 1971 interview with Charlie Gillett he said: "I love the authentic rhythm and blues more than anything, and I also like to live well." From the 1950s until the mid-1960s, he worked as a session musician, recording under his own name and with others such as The Coasters, with whom he recorded "Yakety Yak" and "Charlie Brown", among others. Buddy Holly hired him for session work, during which they recorded "Reminiscing." Holly wrote this song, but gave Curtis the songwriting credit for flying down to the session. His best-known singles from this period are "Soul Twist"—his highest-charting single, reaching number one on the R&B chart and number 17 on the Billboard pop chart—and "Soul Serenade." He provided backing on a number of songs for LaVern Baker, including her 1958 hit single "I Cried a Tear", where his saxophone became "a second voice". In 1965 he moved to Atlantic Records and recorded his most successful singles, "Memphis Soul Stew" and "Ode to Billie Joe" (1967). In 1966 Curtis recorded 3 songs with Jimi Hendrix, "Linda Lou", "Baby How About You" and "I Can't Take It". Unissued the tapes were later destroyed in a fire at Atlantic's master tape library. He worked with The Coasters, and led Aretha Franklin's backing band the Kingpins. The Kingpins opened for the Beatles during their 1965 performance at Shea Stadium. Curtis produced records, often working with Jerry Wexler and recorded for Groove Records during this period, including the Joe South song "Games People Play" with guitarist Duane Allman. In March 1971 he appeared with Aretha Franklin and the Kingpins at the Fillmore West, which resulted in two live albums: Aretha Live at Fillmore West, and Curtis' own Live at Fillmore West. In July 1971, Curtis recorded saxophone solos on "It's So Hard" and "I Don't Wanna Be a Soldier" from John Lennon's Imagine. Along with the Rimshots, he recorded the original theme song for the 1971 hit television show Soul Train, titled "Hot Potatoes". On June 17, 1971 Curtis played at the Montreux Jazz Festival, in the Casino Kursaal, with Champion Jack Dupree, backed by Cornell Dupree on guitar, Jerry Jemmott on bass and Oliver Jackson on drums. The recording of the concert was later released as the 1973 album King Curtis & Champion Jack Dupree – Blues at Montreux on the Atlantic label. Curtis was killed on August 13, 1971, when he was stabbed during an argument with a pair of drug dealers he discovered on the steps outside his Manhattan apartment. Curtis was attempting to carry an air conditioner into his apartment when Juan Montanez refused to move from the entrance. A fight ensued and Montanez stabbed Curtis. Curtis was transferred to Roosevelt Hospital, where he died. In March 1972, Montanez was sentenced to seven years for second-degree manslaughter, but was released in late 1977 for good behavior. On the day of Curtis's funeral Atlantic Records closed their offices. Jesse Jackson administered the service and as the mourners filed in, Curtis's band, the Kingpins, played "Soul Serenade". Among those attending were Ousley's immediate family, including sister Josephine Ousley Allen, other family members, Aretha Franklin, Cissy Houston, Brook Benton and Duane Allman. Franklin sang the closing spiritual "Never Grow Old" and Stevie Wonder performed "Abraham, Martin and John and now King Curtis". Curtis was buried in a red granite-fronted wall crypt in the 'West Gallery of Forsythia Court' mausoleum at Pinelawn Memorial Park in Farmingdale, New York, the same cemetery where Count Basie and John Coltrane are buried. In 1970, a year before his death, Curtis won the Best R&B Instrumental Performance Grammy for "Games People Play". He was posthumously inducted into the Rock and Roll Hall of Fame on March 6, 2000. 1966 "Something on Your Mind"
1968 "(Sittin' On) The Dock of the Bay"
^ a b Eagle, Bob; LeBlanc, Eric S. (2013). Blues - A Regional Experience. Santa Barbara: Praeger Publishers. pp. 344–345. ISBN 978-0313344237. ^ Porter, Bob. "King Curtis". AllMusic. Retrieved May 21, 2009. ^ Litweiler, John (1994) . "1". Ornette Coleman: A Harmolodic Life (paperback ed.). New York: Da Capo. pp. 27–28. ISBN 0-306-80580-4. ^ a b c d Theroux, Gary; Howard Rye (February 15, 2010). "Curtis, King". Oxford Music Online. Retrieved February 16, 2010. ^ a b Larkin, Colin (February 15, 2010). "King Curtis". Oxford Music Online. Retrieved February 16, 2010. ^ "The saxophone holds a special place in rock 'n' roll". NY Daily News. June 19, 2011. Retrieved January 20, 2016. ^ Shaw, Arnold. Honkers and Shouters. New York: Macmillan Publishing Company. pp. 460–466. ^ "Imagine". AllMusic. Retrieved May 21, 2009. ^ "King Curtis & Champion Jack Dupree – Blues at Montreux". Discogs. Retrieved September 22, 2017. ^ Kernfield, Barry Dean. New Grove Dictionary of Jazz. Grove's Dictionaries. p. 544. ^ "Tortorici, Frank, "King Curtis", VH1". Archived from the original on June 5, 2011. Retrieved May 10, 2017. ^ Band, Hittin' The Web with The Allman Brothers. "Hittin' The Web with The Allman Brothers Band :: Where Music Plus Friends Equals Family". Allmanbrothersband.com. Retrieved June 6, 2016. ^ Poe Randy; Gibbons, Billy F. Sky Dog. Backbeat Books. p. 195. ^ John Tobler (1992). NME Rock 'N' Roll Years. Reed International Books Ltd. p. 229. CN 5585. ^ Jet, Vol. 40, No. 23. Johnson Publishing Company. September 2, 1971. pp. 54, 55, 56. ^ "Curtis "King" Ousley (1934 - 1971) - Find A Grave Memorial". Findagrave.com. Retrieved January 20, 2016. ^ Clifford, Mike; John Futrell. The Illustrated Encyclopedia of Black music. Harmony Books. p. 36. ^ "King Curtis (Rock and Roll Hall of Fame)". Rockhall.com. Retrieved May 21, 2009. ^ Whitburn, Joel (2003). Top Pop Singles 1955-2002 (1st ed.). Menomonee Falls, Wisconsin: Record Research Inc. pp. 384–385. ISBN 0-89820-155-1. ^ Whitburn, Joel (1996). Top R&B/Hip-Hop Singles: 1942-1995. Record Research. p. 248. ^ "King Curtis". AllMusic. Retrieved May 21, 2009. Clifford, Mike: Futrell, John and Bonds, Ray. The Illustrated Encyclopedia of Black music. Harmony Books (1982). Digitized December 29, 2006. "King Curtis". Rock and Roll Hall of Fame.